Millennials are shaking up everything from politics to the way they approach parenthood to how they use public libraries (they actually use them more). One of the last frontiers? Writing a last will and testament is a classic financial chore–which many people assume costs a lot of money and requires hours (or days or weeks or months) of focused time with an attorney. Young people are thinking differently about protecting their families. And in doing so, they are dragging Gen Xers and Baby Boomers along with them. To understand what’s behind some of these shifting demographic patterns, researchers at Fabric, a company bringing the life insurance and wills experiences into the 21st century, explored trends among real customers writing a last will and testament. Did you think a will was a 40-page document printed on thick, ivory paper? Not anymore. Not only have tens of thousands of people made a will online with Fabric, but almost two thirds made a will on their mobile devices. In fact, our customers created more than twice as many wills on mobile as on their desktop computers. As you might expect, a lot of the people writing online wills are young (62 percent of Fabric customers are between ages 25 and 40) and younger people seem especially open to making a will on-the-go: Almost 3 out of 4 people under age 35 made their will on a phone or tablet. 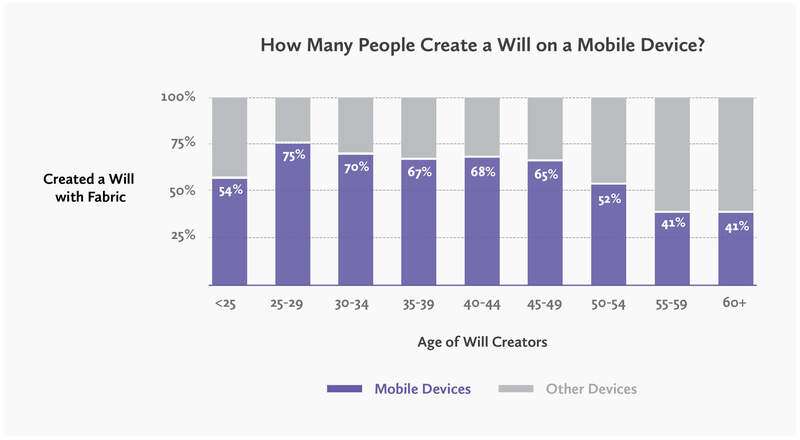 Among customers ages 35 to 49, two-thirds made a will on mobile. Among customers ages 50 to 54, more than half made a will on mobile. Among customers over age 55, 2 out of 5 made a will on mobile. This fits with a broader demographic trend that millennials tend to adopt new technology the most, but older generations also embrace digital life. Most Fabric customers are creating a will because they’re parents and want to appoint a legal guardian and make other provisions for their kids (more than 70 percent of our will-makers have kids under 18). But that still leaves thousands of customers who created a will even though they don’t have young children. What’s driving them? Before the internet age, writing a will was often a lesson in drudgery. But creating a will may not take as long as people assume. Enter the “why not” factor: The median time to create a Fabric will was seven minutes, and more than 3 in 4 people created a will in under ten minutes. Of course, these customers also have people they want to take care of, even if they don’t have kids. 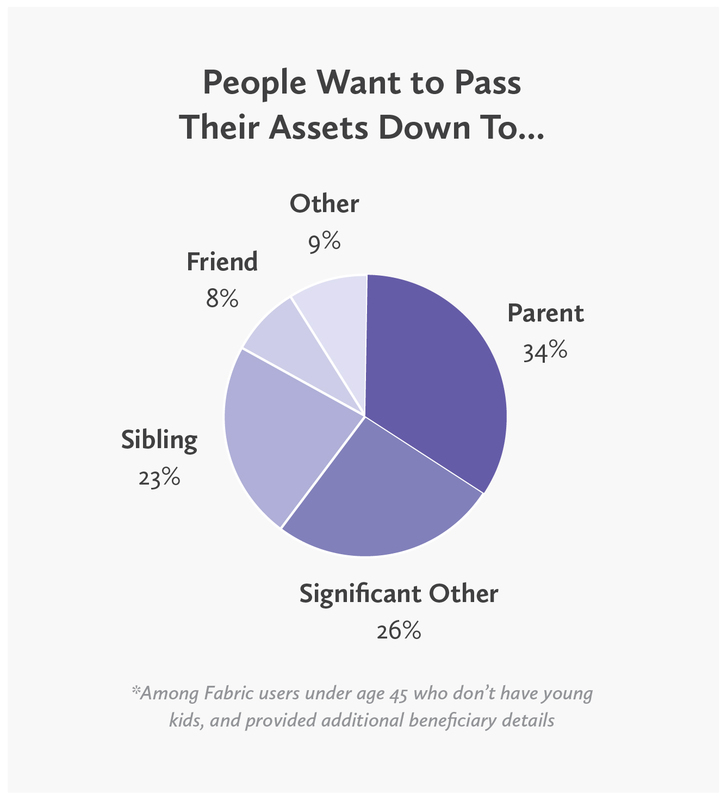 Among Fabric customers under age 45 who don’t have young kids (and provided additional details about their beneficiaries), the most common response was that they wanted to provide for their parents, followed by their significant others. Interestingly, among that group, men seemed most interested in providing for their partners, while women seemed more keen on caring for other people in their lives—43 percent of men chose their partner as their main beneficiary, whereas only 19 percent of women designated their partner as their primary beneficiary. This aligns with society’s views on men’s roles compared to women’s. Men might feel more pressure to support their partners: Despite professional gains for women, 7 in 10 adults still say it’s very important for a man to be able to support a family financially, whereas only 3 in 10 say the same about women. 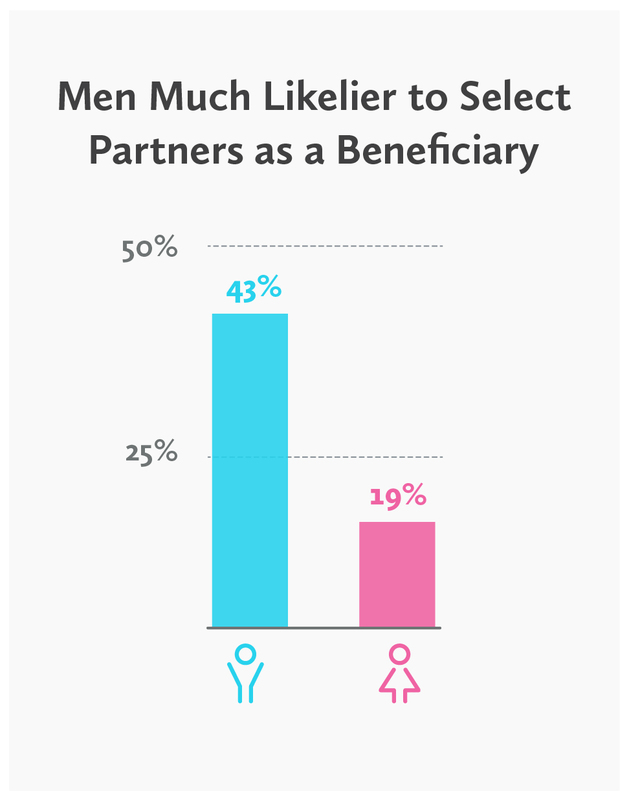 Another possibility is that some of the men feel their partners would struggle to support themselves in their absence, while the women have more confidence in their partners’ financial stability. According to Pew Research, men earn more than women in roughly two-thirds of couples that are married or cohabitating. 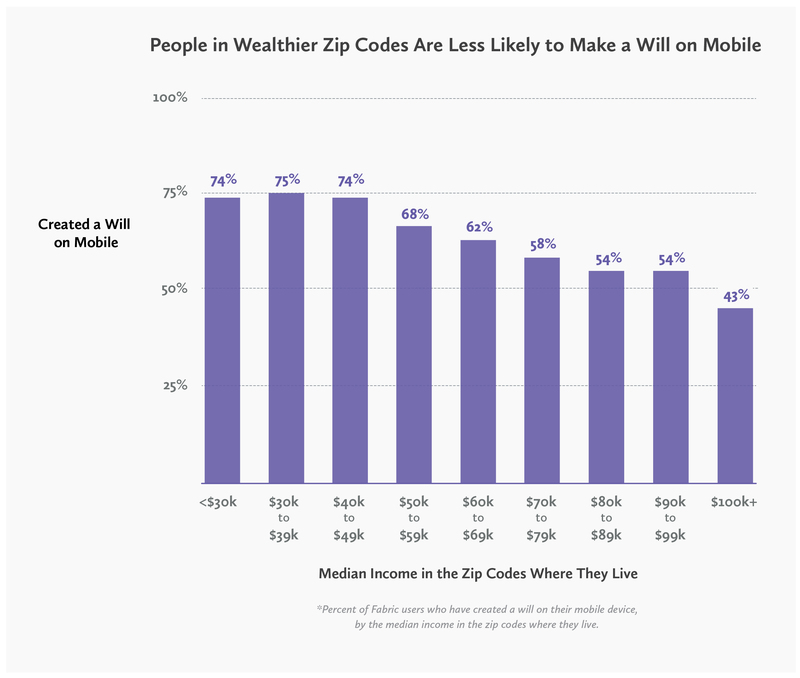 People residing in zip codes with a median income below $40,000 made a will on mobile about 75 percent more frequently than residents of zip codes with median incomes of $100,000 or more. You might expect wealthier people to have nicer smartphones and therefore use them more. But these days most Americans have smartphones. 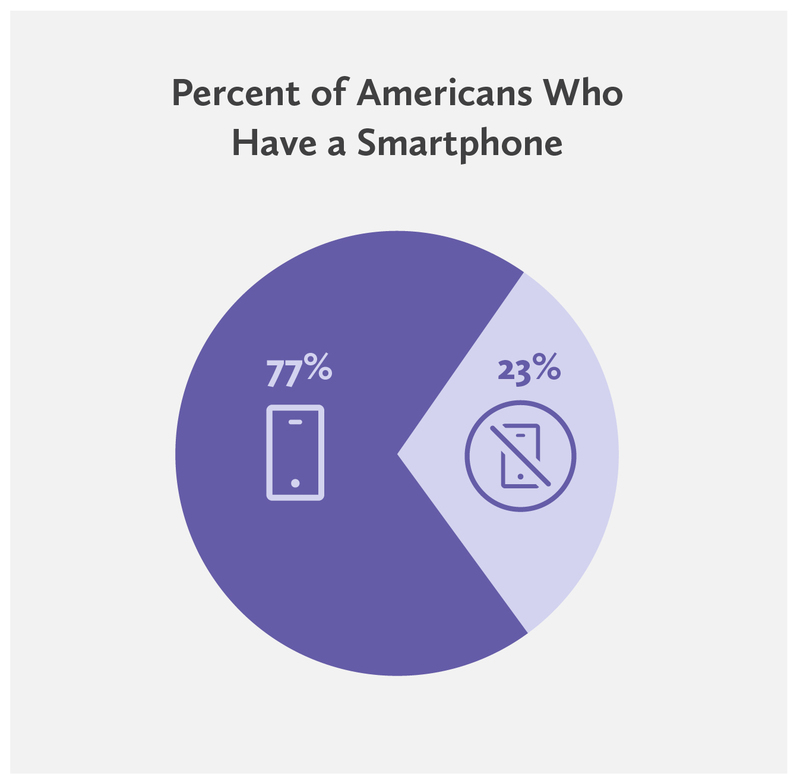 (According to Pew Research, 77 percent of all Americans have smartphones, including 82 percent of those making $30,000 to $49,999). Another possible explanation is that wealthier people have more complicated financial needs and feel more comfortable hunkering down in front of a computer to think through the ins and outs of writing a will. Whatever the reason, Fabric believes everyone deserves an opportunity to plan for his or her family’s future. Many people put off writing a will because it seems too complicated or time-consuming, or because they don’t have the money to spend on a lawyer (more than half of American adults don’t have a will). By enabling people to use the technologies they want–like smartphones–Fabric provides an easy and free way to help all Americans protect their families. 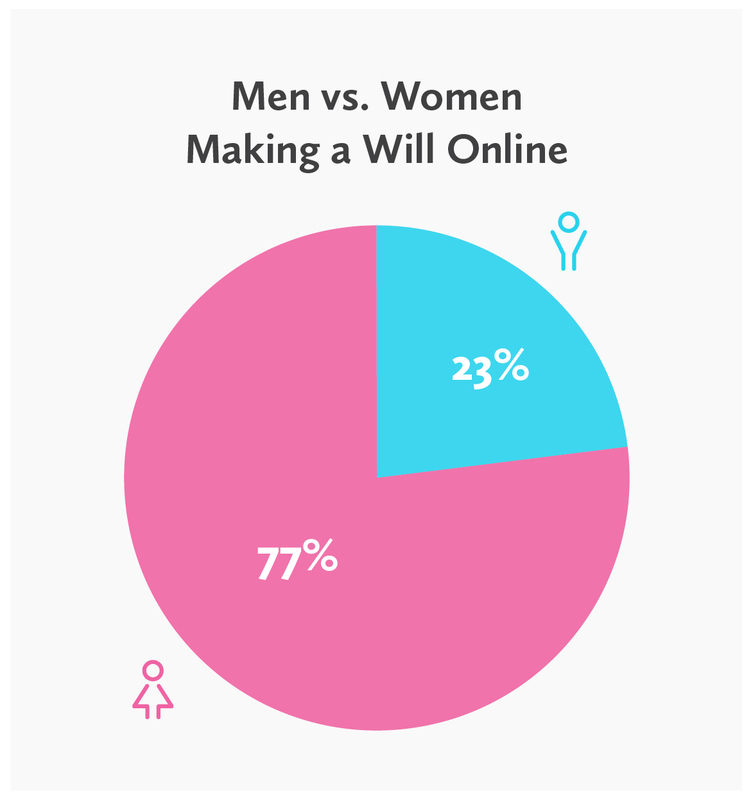 Women are creating wills in higher numbers, and doing it on mobile. Among people who made an online will with Fabric, almost 8 in 10 are women. And women write a will on their phones about 55 percent more often than men. Maybe it’s because our female customers are more than 35 percent likelier to have kids under 18 than our male customers (whether because women in dual-parent households tend to make a will more frequently, or because women are more often single parents than men), so they have more impetus to create a will in the first place. Or maybe women are using their phones more because they tend to have less free time than men, a difference that persists between mothers and fathers, as well. Another possible reason for women’s comfort doing serious estate planning on their mobile devices is that they adopt technology more readily than men. Or maybe it’s because, according to our data, the average woman tends to be less affluent than the average man. Blame it on the gender gap, but our male customers skew significantly more toward affluent zip codes. Men are 36 percent more likely to live in a zip code where the median income is $70,000 or more, while women are more than 31 percent likelier to live in a zip code where the median income is under $50,000. 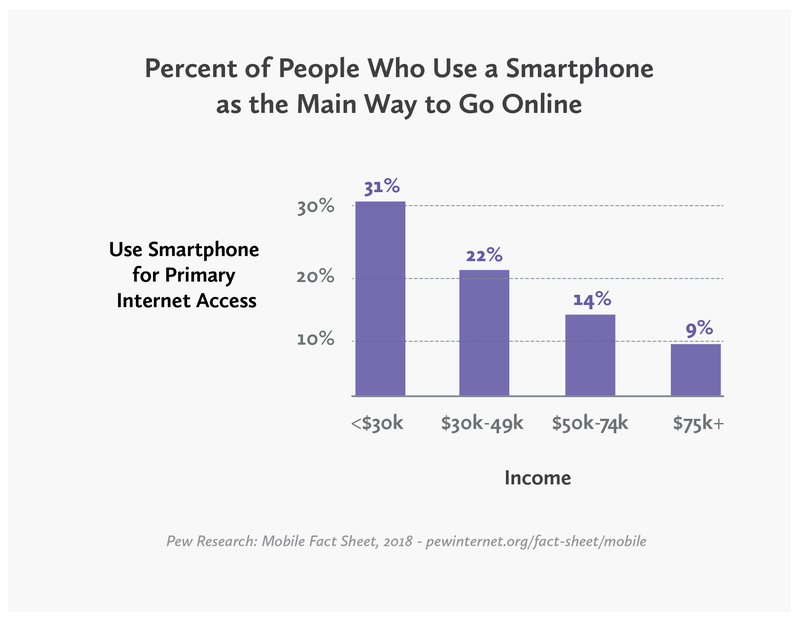 And as we’ve seen, there’s a correlation between lower incomes and higher mobile usage. If you have kids, it’s important to designate a legal guardian when writing your will, as this is the person who’d take care of your children if you were to pass away. 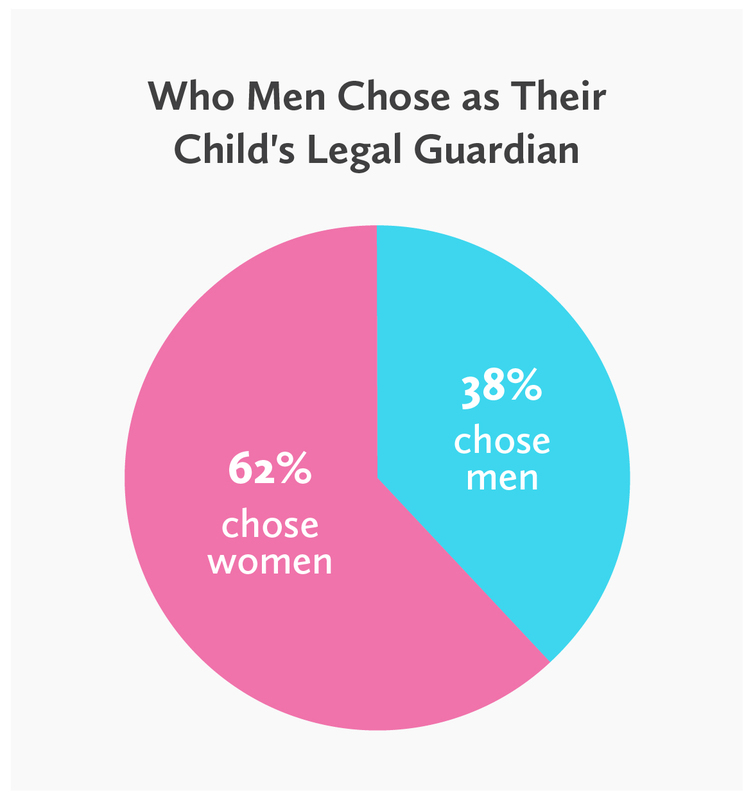 On the whole, 62 percent of parents with young kids choose a woman as their kids’ legal guardian. Both genders choose women, though female will-makers are almost 25 percent likelier to choose other women. 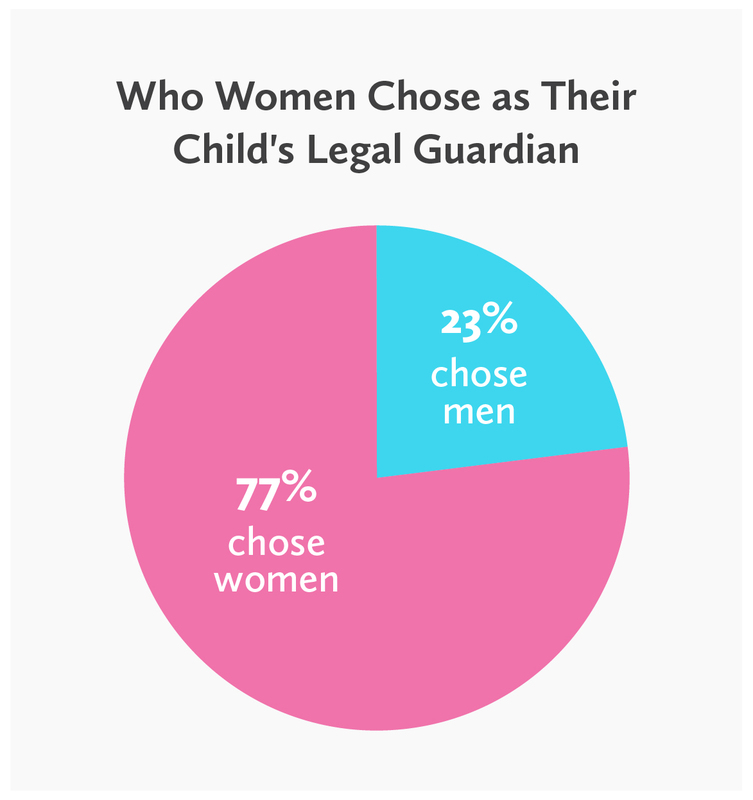 People living in areas with a median income of $100,000 or more are almost 20 percent likelier than people in areas with a median below $30,000 to designate a woman as their children’s legal guardian. We can’t say why people in affluent areas tend to designate women more frequently, but one hypothesis is that the gender wage gap persists across all industries, meaning that women make less than men at all levels. In higher income brackets, this may still be enough to support a child. But, perhaps, when people in lower income brackets think about those they know who could afford to raise an extra child without an undue burden, the answer is more frequently male. 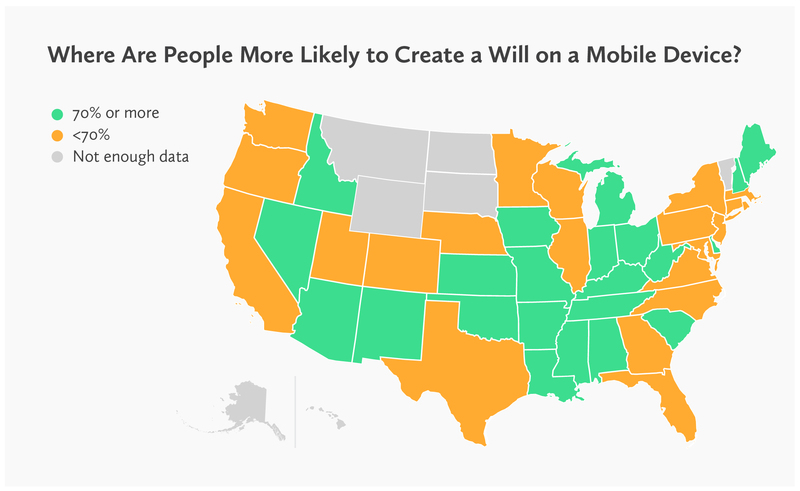 Michigan had the highest rates of people creating a will on mobile (among states where at least 200 people created a will), with 3 out of every 4 Michiganders making a will on a mobile device. Following closely behind, 71 percent of Arizonans and 70 percent of Tennesseans created a will on a mobile device. The connection between median income and making a will on mobile holds true on a state level, too. States with lower median incomes tend to have higher rates of people creating a will on mobile—the seven states with the highest rates of people making wills on mobile all have median incomes below the national average. Georgia is a notable exception: Despite having below-average median income on a national scale (the state’s median income is $51,244, compared to a national median income of $57,617), Georgia had a particularly low rate of creating a will on mobile. Georgians were 22 percent less likely to make a will on mobile than an average Fabric user. All data, except where noted, comes from users who created a will through Fabric. The total data pool is in the tens of thousands, and all comparative statements have undergone a chi-squared analysis to determine statistical significance. For the data on beneficiary choices among will-creators who don’t have young children, users were screened by those who (1) indicated in their will that they do not have children under age 18; (2) are themselves under age 45, to account for users who may have adult children; (3) applied for Fabric Instant, which provides additional beneficiary detail.